How do I use the HTC? The webcast above, presented by Elizabeth Rosin, Principal at Rosin Preservation was recorded on May 4, 2017. The following content was developed in association with the webcast and is accompanied by links and additional tools and resources. Public Law 115-97, the federal tax legislation enacted on December 22, 2017, retained the 20% Historic Tax Credit (HTC), but required that the HTC be taken over 5 years. The legislation also provided transition rules. As always, anyone interested in using the HTC is advised to consult an accountant, tax attorney, or other professional tax advisor regarding how the HTC and these recent changes may affect them. The 20% federal HTC is a financial incentive that supports investment in historic buildings. It encourages private property owners to rehabilitate historic properties for an income-producing use, such as rental housing, office, retail, manufacturing and entertainment space. It is an important tool for the redevelopment of historic Main Streets and can be a catalyst for neighborhood and downtown revitalization. It can also be an effective tool to create affordable housing, including mixed-use developments that have commercial space on the first floor and residences on the upper floors. Through HUD’s Rental Assistance Demonstration (RAD) program, Public Housing Authorities can partner with private investors interested in the HTC to rehabilitate historic public housing developments. Projects receiving Low-Income Housing Tax Credits (LIHTC) may raise additional equity if they also qualify for the HTC. The HTC rewards owners for making an investment that extends the economic life of older buildings and helps to revitalize communities, and it becomes a source of project equity when syndicated to outside investors. 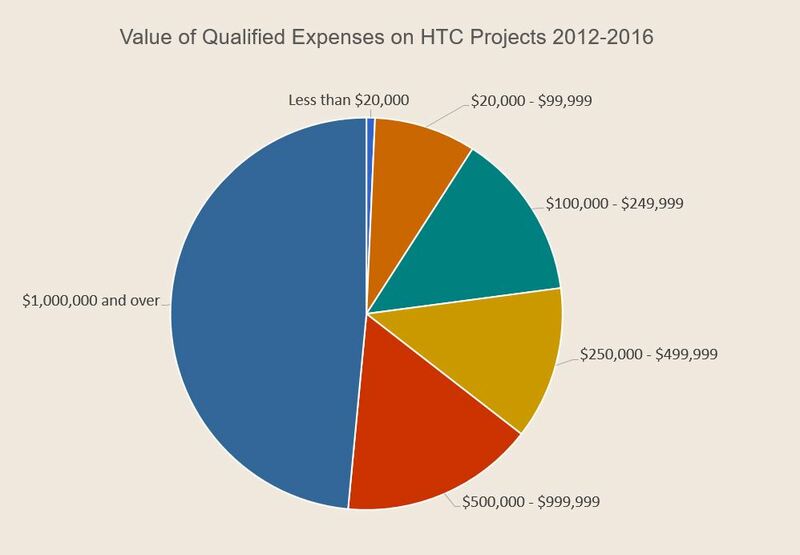 A project can claim HTC equal to 20% of qualified expenses. The tax credit directly reduces income taxes owed. Each dollar of tax credit offsets one dollar of taxes due. A project with $1 million of qualified expenses will generate $200,000 of HTC to offset $200,000 of federal income taxes. 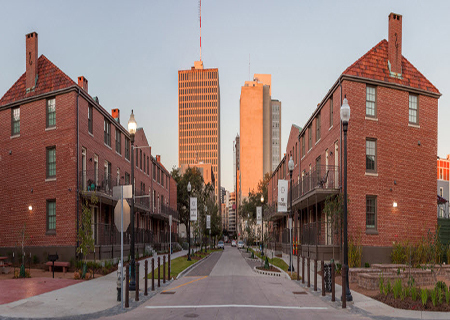 Historic tax credits benefit a wide range of building types and communities throughout the United States – urban centers, small towns, rural areas. They include high-style architect-designed masterpieces as well as simple functional buildings. HTC projects can be catalytic for community revitalization. Many communities have a “white elephant” building that may qualify for the program. Vacant school buildings, for instance, are frequently converted to affordable housing. Champlain Street, Burlington, VT: While some historic affordable housing projects transform large commercial or industrial buildings for residential use, many use the credits to upgrade existing workforce housing. The $900,000 rehab of this small Victorian apartment building is a great example. The project removed non-historic vinyl siding and windows, preserved distinctive historic elements, and updated interior systems and finishes. It will continue to provide affordable housing in a working class residential neighborhood. While large, high-dollar rehab projects attract a lot of attention, buildings of all sizes can take advantage of the HTC. This map prepared by the National Trust for Historic Preservation shows the distribution of HTC projects nationwide between 2002 and 2016. You can see that projects have been completed in all 50 states. Historic Tax Credits (HTC) are available through a non-competitive, open application process. If you meet the program requirements, you can claim the credit. The project must involve an “income producing” “certified historic structure”. The scope of work must meet the requirements of a “certified historic rehabilitation” and must make a “substantial investment” in the property, specifically in items that are considered Qualified Rehabilitation Expenditures (QRE). There is no cap on the amount of credits an individual project can claim nor on the amount of credits available for the program in any given fiscal year. Income-producing Properties include all buildings that generate income for their owners. Office buildings, retail stores, hotels, restaurants and rental apartments are the most common uses. Buildings owned by a for-profit owner but leased to a non-profit institution may also qualify, but check with your tax advisor. Owner-occupied dwellings are not eligible for the HTC, and buildings must remain income-producing for 5 years after rehab is complete. Certified Historic Structures are buildings listed in the National Register of Historic Places either individually or as contributing resources to a historic district. Buildings determined to be non-contributing to a historic district (because of age or alterations) are not able to use the HTC. While other types of resources (bridges, structures, objects, landscapes, etc.) can be listed in the National Register, they do not meet the Internal Revenue Service (IRS) definition of a “building” that is required to use the HTC. A building can apply for National Register designation while applying for the HTC. A certified historic rehabilitation meets the Secretary of the Interior’s Standards for Rehabilitation (Secretary’s Standards). The State Historic Preservation Office (SHPO) and the National Park Service (NPS) review photographs of the building, architectural plans, and a written scope of work to ensure that the project preserves the character-defining features of the historic building, site, and environment. If you previously made improvements to the building those need to be added to the equation, and any earned depreciation can be subtracted. A simple way to visualize QRE is to imagine turning the building upside down. Anything that falls out is NOT QRE. QRE must meet the substantial investment test in a 24-month period. The applicant has some flexibility in defining that window, but if needed the project can be phased to extend the 24-month window to 60 months (5 years). The application must present the phases, in both a narrative description and architectural plans, at the start of the project, although the phasing plan can be amended later in the project. Because the extended rehabilitation period may require recalculation of the adjusted basis for the later phases of work, check with your tax advisor if you are considering a phased project. Projects that use the HTC must involve a building listed in the National Registrar of Historic Places. The National Register of Historic Places is the nation’s list of historic buildings, structures, sites and objects that merit preservation. The National Register was created by the National Historic Preservation Act of 1966, and it is administered by the National Park Service with input from the State Historic Preservation Offices (SHPOs). Typically, resources must be at least 50 years old to qualify for National Register designation. There are exceptions for newer resources that can demonstrate exceptional significance. As mentioned above, only designated buildings are eligible for historic tax credits. To find out if a property is on the National Register contact your SHPO or visit the National Park Service (NPS) website. In addition to its age, a National Register property must demonstrate that it has significance at the national, state or local level in at least one of four areas. These include association with historical events or patterns of history, association with important persons, and architectural or artistic distinction. The fourth criterion, the ability to yield information about history or prehistory, mainly applies to archaeological sites. A property that is on the National Register as part of a historic district can have less individual significance as long as it supports the significance of the larger whole. Finally, the appearance of a property must be able to communicate its period of construction and its historic significance, a quality referred to as architectural integrity. Resources that have integrity appear much as they did when they were built or achieved historic significance. The National Register program defines seven types of integrity – location, setting, design, materials, workmanship, feeling, and association. Changes to a building that remove historic material or add new elements can weaken integrity in one or more areas. When alterations compromise integrity to the point that the building would not be recognizable to the people who knew it during its period of significance, it is no longer eligible for National Register listing. One persistent myth about the National Register is that designation limits how a building can be changed or used and will impact future sale of the building. 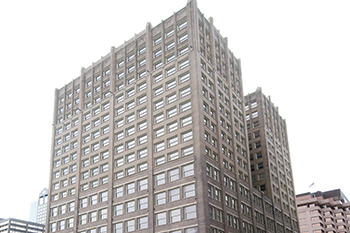 Listing in the National Register does not inherently impact how an owner uses a building or changes a building unless the owner chooses to use a federal incentive (such as historic tax credits or a federally-funded grant program) or if the property is subject to a federal permit or other action (such as licensing for a cell tower). Similarly, National Register listing offers a layer of protection to properties that may fall within the path of a federal undertaking, such as a highway construction project. Some states and localities do require a review when changes are proposed to historic buildings to ensure that the changes are compatible with the property’s character. This review is often triggered by a building permit and usually focuses on the exterior facades. Check with your SHPO or local planning department to see if this type of review applies in your area. The preservation guidelines that apply to HTC projects are the Secretary of the Interior’s Standards for Rehabilitation [36 CFR 67.7]. Rehabilitation encourages the retention of surviving historic material and features, but also accommodates modifications that enable a building to be adapted for a new function and that allow it to remain economically viable. An HTC project must meet all 10 standards as they apply to both the building’s exterior, interior, and site. NPS Guidelines for Rehabilitation provide general advice in a recommended/not-recommended format. Each building is viewed as unique in its architecture, history, current conditions, and context for redevelopment. Reviewers consider the individual building history and circumstances to determine appropriateness of proposed treatments. The NPS website features an array of technical guidance. Preservation briefs and technical case studies discuss how specific building elements and rehabilitation treatments will be reviewed. They illustrate successful solutions for a wide variety of common rehabilitation concerns, such as windows, masonry, building additions, corridors, large historically-open spaces (such as an auditorium), and adapting elements that do not meet modern building code (such as low railings). There is no need to reinvent the wheel when completing a rehab project. If you encounter an issue, it is likely someone else encountered – and solved - it before you. In addition to the on-line guidance from NPS, SHPO staff are a resource for finding appropriate solutions. Often they are able to make a site visit to help explore options. HTC applications are reviewed first by SHPO and next by NPS. The application has three parts. The National Register (NR) status of your building at the start of the project determines where you enter the application process. If your property is not listed on the NR, you would start by preparing a draft nomination and filing this with your part 1 application. If your property is already contributing to a historic district, you file the part 1 to confirm that status. If your property is individually listed, you can go directly to part 2. The process for part 2 and part 3 is the same for all projects. For buildings that are not already on the NR, the Part 1 provides detailed information about the building’s physical appearance, architectural integrity, history, and significance. The Part 1 documentation should be equivalent to a draft NR so that the reviewers can determine if the building is NR eligible. While the Part 1 approval is a preliminary determination, it provides developers, investors and lenders with a level of comfort before the project moves forward. After the Part 1 is approved, the owner can apply for official National Register designation. This is a separate process from the HTC review and takes 6-9 months to complete. Rehabilitation can begin before the building has NR status, but the building must be officially listed on the NR within 30 months after the rehabilitation is completed. Tax credits can be claimed while the nomination is in progress, at the owner’s risk. A critical piece of the Part 1 application is documentation of the building’s appearance before rehabilitation starts. “Before” photographs showing existing conditions on the exterior and interior are required to illustrate the configuration and relationship of spaces; the types and conditions of building materials; and the character-defining features and finishes that communicate the historic style, function and significance of the property. The Part 2 application includes a detailed description of proposed treatments, including materials and techniques to be used, and presents architectural plans and pertinent construction specifications. Architectural plans should be sufficiently developed to show how historic features will be treated and/or altered and how new elements will be added. Additional photos documenting in detail the existing (“before”) conditions are submitted with the Part 2. If SHPO or NPS feels that an element of the scope does not meet the Standards, they will place a condition on the approval. As long as the completed rehabilitation addresses this condition, the Part 3 application will be approved at the end of the project. The reviewers prefer to issue a “clean” approval with as few conditions as possible (preferably none), and will help applicants figure out how to revise the scope of work to meet the Standards. Applicants can file an amendment to officially revise the scope of work to address any conditions. Approval of the amendment assures the applicant that NPS will approve the revised approach when the Part 3 is submitted. An amendment can also be filed if new information becomes available or if the scope of work evolves during construction. Construction can start before NPS approves the Part 2 application, but at increased risk. If at the end of construction any element of the scope does not meet the Standards, the credits cannot be claimed. Part 1 confirms that the building is a certified historic structure eligible for historic tax credits. In other words, it must be contributing to a National Register historic district or determined eligible for NR listing. Part 1 is not required for individually listed buildings, unless the nomination includes more than one resource. In this case, as with a district, a Part 1 must be submitted to indicate which building(s) are contributing or non-contributing. Part 2 presents the scope of work for the rehabilitation and is reviewed to verify it will meet the Secretary’s Standards for Rehabilitation. Many investors and lenders require an approved Part 2 application before they will close on project financing. Part 3 certifies that the completed rehabilitation meets the Secretary’s Standards. The submittal includes “after” photos documenting the exterior and interior of the completed rehabilitation, estimated QRE and total project costs, and ownership information (for assignment of credits). The date of Part 3 approval must be attached to IRS documents in order to claim the credits. If a project is phased, the amendment certifying completion of that phase may be used to evidence of pending approval. The NPS charges a fee to review the Part 2 and Part 3 applications. The fee has a sliding scale based on the project cost. The applicant pays half of the fee when NPS receives the Part 2 application and half when NPS receives the Part 3 application. The owner of the historic property may claim the HTC after rehabilitation is complete and certified as meeting the Secretary’s Standards (Part 3 approval). The owner must be a for-profit taxpaying entity, but that can take several forms. A fee simple property owner of the property may be an individual, partnership or corporation. A limited partnership can distribute the benefit to its members. In this scenario, an equity partner can invest in the project in exchange for rights to the credit. The investment helps finance rehabilitation. Historic projects typically sell for varying amounts, but in 2017, a typical project atrracts a net investment of $.70/$1 HTC that will be allocated. IRS Safe Harbor rules issued in 2015 require that the investor be a real partner with potential for both upside (gains) and downside (losses) in the deal. Under some circumstances the lessee of a newly rehabilitated building can claim the credit if the lease term exceeds 80 percent of the depreciation period (39 years for non-residential property and 27.5 years for residential rental property). After a project is certified to receive the HTC (Part 3 approved), the owner can use the credit to offset income tax liability dollar-for-dollar, beginning the year the building is placed in service (rehab is complete). It can be carried back one year and forward for up to 20 years. Always check with a tax advisor before starting a project to understand how the HTC will apply to your specific circumstances. Claiming the credit is very straightforward. The taxpayer submits IRS Form 3648 along with the NPS project number with their annual tax documents. The amount of the credit calculated on Form 3648 is factored into final calculations and deducted from the bottom line of taxes owed. If your project has not yet received Part 3 approval you must complete that step within 30 months after the placed in service date. If a project has multiple phases, partial credit may be claimed when one or more phases of work are ready to be placed into service and the substantial investment test is met. The partial credit drawdown will be subject to recapture if the project does not receive Part 3 certification. HTC are also subject to recapture if the building ownership changes or non-compliant changes are made within 60 months after NPS certifies the rehabilitation (Part 3 approved). Recapture is pro-rated based on amount of time passed since issuance of credits. The HTC can be coupled with other local, state and federal incentives. State historic tax credits are currently available in 34 states, and nearly half of all federal HTC projects are twinned with this incentive. Many state HTCs can be directly transferred (i.e. sold) to other businesses or individuals who want to offset their state tax obligation. If your project is in a state that also has a state HTC, check with your tax advisor to see if these are transferable and by what means. The two most common federal incentives used with the HTC are the Low Income Housing Tax Credit (LIHTC) and New Markets Tax Credits (NMTC). Other federal, state and local Incentives that developers often use to finance rehabilitation include HOME Investments Partnership Program (HOME) and (Community Development Block Grant) CDBG funds, United States Department of Agriculture (USDA) rural loan programs, Brownfields grants, tax abatement, and tax increment financing (TIF). Investment in an HTC project can also count toward Community Reinvestment Act (CRA) requirements for banks. Be aware that a federal grant may affect the amount of HTC a project receives. If your project is using additional sources of federal funds, be sure to consult with your tax advisor to understand how these funds may affect your project. HTC projects have rehabilitated over 150,000 units of affordable housing since 1976. Some of these projects were originally developed as affordable housing, while others adaptively reuse buildings constructed for other purposes. The HTC and LIHTC program guidelines are generally compatible, although there are some notable differences in how the credits are calculated, which costs are QRE, and when the credits are awarded. The HTC will reduce the eligible basis for the LIHTC, although the LIHTC does not affect the amount of HTC a project earns. Combining the HTC with the LIHTC is very attractive to affordable housing developers because it attracts additional equity to a project. View a detailed side-by-side comparison of the two programs. Assemble a team of experienced, knowledgeable professionals to make your project run smoothly. These might include a preservation consultant who understands the application process, procedures, and Standards; an architect and structural and Mechanical, Electrical, and Plumbing (MEP) engineers who are experienced with historic buildings; and a real estate attorney and tax accountant who are familiar with the tax rules related to the HTC. Team members should have a track record of recent success on HTC projects similar to yours. Ask for references. Have they worked on projects similar to yours (e.g. conversion of a historic school to affordable housing)? Find out what kinds of obstacles they encountered on other projects and how they overcame those obstacles. Initiate contact with SHPO staff early in the process and maintain regular communication. SHPO staff are often able to visit the project site during the planning stage. They can help identify key historic elements that will be critical to retain during the project and can suggest appropriate rehabilitation strategies. If the situation is particularly complicated, SHPO can bring NPS into the conversation. Their wealth of experience can provide creative solutions and ideas. Allow ample time for the review process. At minimum the review period is 60 days (30 at SHPO + 30 at NPS). Once you build in administrative time to transmit and log application packages, it is not unusual for the review period to run 90 days, particularly at peak periods in the construction cycle. While these timeframes can sound daunting, they usually mesh well with the general development process if you anticipate them from the outset. A set of plans shared with contractors for pricing may be sufficiently developed to submit for Part 2 review. You will sleep better knowing the Part 2 has been approved before major expenditures have occurred and the hammers start swinging. Rehabilitation plans may evolve during construction. An unexpected condition might be discovered in the field, budgets can modulate, new tenants may make specific requests. If plans change, do not assume that the revisions will meet the Standards. Submit an amendment for SHPO and NPS to review. Throughout the process, address issues proactively before they become problems. Engage SHPO in addressing these situations whether they occur before, during or after construction. Cherokee Terrace, Enid, OK: Cherokee Terrace was built as a Public Works Administration project in 1937. The 80 apartments fill eight buildings on a landscaped 6.6-acre site. In 2016 the owners completed an $11 million rehab using HTC and LIHTC with a focus on updating building systems and refreshing finishes. The complex continues to provide affordable housing for families in Enid.